Today I have Sechin Tower, author of Mad Science Institute, here with a guest post titled “Why Sci-Fi Is Pessimistic, and Why It Doesn’t Have To Be”. We evolved to be intelligent creatures with the ability to anticipate danger and learn from others, and that influences how—and why—we tell stories of danger and darkness. Imagine our caveman ancestors living in a world surrounded by deadly predators. If one of them wandered into a cave and got eaten by a saber-toothed cat, the other members of his hunting party had the ability to tell the story to warn others away. Those who paid attention lived, and those who didn’t ended up as smilodon kibble. We are the descendants of people who survived in part because they told and listened to stories. Science fiction writers often make their stories frightening because they know we are instinctively inclined to listen to warnings about the bad things that could happen. Sure, most of the dangers portrayed in science fiction aren’t as immediate as saber-toothed cats were to our ancestors, and they’re even less realistic: tentacles from the shadows, fanatically genocidal space aliens, and zombie hordes aren’t exactly the leading causes of death in America today. Yet hidden away in these scenarios are warnings and survival strategies for real-world problems. Trouble is, all this adds up to a pretty pessimistic view of the future. If you read enough of these stories, the glass won’t seem half-full, it will seem cracked, drained, and ground into silicon used to make killer cyborgs. Pessimism makes for great stories, but is there a way to escape the negativity? Probably the most famous example of optimistic science fiction is Star Trek, which presents a society that has solved the problems of racism, poverty, and nationalistic war. Maybe more authors could experiment with portraying a future so bright it’s worth fighting the Klingons to preserve. Another way science fiction can be optimistic is to look back to the ancient world, to mythological stories where the hero travels through unknown lands to bring back a gift or a boon to the rest of humanity. We can see this idea in a few science fiction books, such as Robert Heinlein’s YA classic “Have Space Suit, Will Travel,” in which Kip Russell battles tentacle-faced aliens and returns to Earth with scientific secrets that will unlock antigravity and faster-than-light travel. I would love to see other authors pick up the torch here, too, and have a hero who returns with more than just the head of the hive queen. 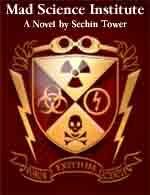 Sechin Tower is a teacher, game designer, and the author of Mad Science Institute, a novel of creatures, calamities, and college matriculation. He lives in Seattle, Washington. Sophia “Soap” Lazarcheck is a girl genius with a knack for making robots-and for making robots explode. After her talents earn her admission into a secretive university institute, she is swiftly drawn into a conspiracy more than a century in the making. Meanwhile and without her knowledge, her cousin Dean wages a two-fisted war of vengeance against a villainous genius and his unwashed minions. Separately, the cousins must pit themselves against murderous thugs, experimental weaponry, lizard monsters, and a nefarious doomsday device. When their paths finally meet up, they will need to risk everything to prevent a mysterious technology from bringing civilization to a sudden and very messy end.